Vegas Nights Slot Machine - Play Free at Slotorama! 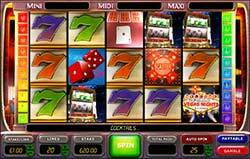 Take a virtual big money trip to Sin City in the IGT favorite, Vegas Nights slot machine! Whether you’re in Vegas to get married or to hit the fruit machines, this game has it covered. You will be spinning across 5-reels and 20-paylines where the bright lights and big win sounds are spell binding and rewarding! On the reels you’ll find a ton of Vegas themed symbols like a Roulette wheel feature, a $10,000 poker chip, Wild Reels on a slot machine, a handsome pair of people toasting, a VIP limo, dice, Ace of spades, the Las Vegas sign, a variety of colored 7’s and much more. Slots Wilds – There is a symbol on the reels that looks like a staggered 4-reel slot machine with Wild written across them and these are your wild symbols. This symbol will replace all others except the scatters and bonus symbols to complete winning combinations when possible. Additionally, each wild will also award a multiplier of 2x, 5x or 10x! Feature Roulette Wheels – Spin 3, 4 or 5 and you will earn some tokens to play the Bonus Mini Roulette feature. The number of feature icons you land determines how many tokens you get for the game. If you land 3, 4 or 5 symbols you’ll earn 5, 10 or 15 tokens worth to play the game! $10,000 Scatter Symbol – The poker chip worth $10,000 is a scatter symbol and when you land 3, 4 or 5 of them on the reels you will win 2x, 5x and 10x your bet instantly. You will also be rewarded with a free spins bonus with Super Wilds featured during this round! You’ll be presented with a board of question marks and you’ll keep selecting to determine how many free spins you win!